Commerce Secretary says Obama wants to end the trade embargo on Cuba but it will take time. President Barack Obama wants to see an end to the American trade embargo against Cuba, but that won't happen quickly, U.S. Commerce Secretary Penny Pritzker has said, following a visit to Cuba. "The president wants to see the embargo lifted, but the president realizes it will take time," she said, according to The Associated Press (AP), alluding to the fact that many Republican lawmakers and some Democrats oppose lifting the embargo at this stage. She added Cuba's dual currency system is a challenge for outside business interests and the island's regulatory system isn't adequate to attract large investment. Relations between the United States and Cuba were formally restored on July 20, seven months after Obama and his Cuban counterpart Raul Castro agreed to restore ties snapped in 1961 during the Cold War. Before the Cuban embassy in Washington opened in July, the United States had officially dropped Cuba from its blacklist as a state sponsor of terrorism, allowing the country to have better access to American banking facilities and aid. In addition, Washington authorized commercial ferry services to Cuba for the first time in more than a half-century. Pritzker, who brought a delegation of officials from the U.S. Treasury, Commerce and State departments, opened her visit Tuesday with a stop at the Mariel free trade zone outside the capital of Havana, according to AP. She is the most senior U.S. official to travel to Cuba since Secretary of State John Kerry visited August 14 for a flag-raising ceremony outside the U.S. diplomatic mission in Havana. 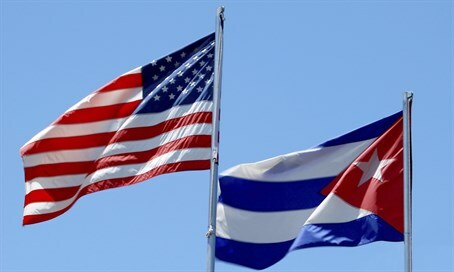 Cuba's foreign ministry said in a statement that the goal of the meetings with Pritzker's group was an "exchange over the reach and limitations of the measures recently taken by the U.S. government to modify some aspects of the application of the embargo against Cuba."